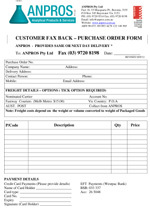 Orders may be placed online (with the exception of Dangerous Goods) by visiting the ANPROS website at www.anpros.com.au. In the case of Online Orders, Freight is via Aust. Post. Both Non – Dangerous & Dangerous Goods can be ordered by telephoning ANPROS Directly on (03) 9720 9514 or 0408 598 138. Dangerous Goods can either be collected from our warehouse in Boronia, Vic. or delivered via Courier. Payment may be made securely online by credit card; or if preferred details can be provided by phone, fax or email. If payment is made by EFT (Electronic Funds Transfer), please fax confirmation to ANPROS on (03) 9720 8198. Please note we have a minimum order value of $20 (plus GST) exclusive of shipping costs. ANPROS Pty Ltd achieved the SAI Global Quality Assurance Management Certification to the ISO 9001: 2000 Standard. This standard has now been up-dated to ISO 9001: 2008 Standard. This internationally recognized Quality Assurance System embraces all aspects of the company’s operations and activities thus ensuring consistency in manufacturing processes, resulting in the production of high quality, chemical analysis reagents. The details of all manufactured products are listed on an ANPROS Manufactured Product Form for quality control purposes. Specific products such as sodium hydroxide solutions (ie 0.010N,0.100N & 1.00N, etc) are NITROGEN PURGED in order to maintain the product in a fresh condition and to extend the shelf life of the product. This data sheet provides details regarding the safety procedures to be used in the case of either spillage, ingestion or inhalation of the product. The C of A information is obtained through the use of Standard Chemical Analysis Procedures. This sheet provides an analysis of the product, thus indicating the chemical assay (%), purity (%) or concentration in terms of Molarity, Normality or percent w/w, w/v or v/v ( where w = weight or mass and v = volume). f. The Pack Size, expressed in gram, kilogram(kg), millilitre or litre. In the case of Dangerous Goods, specific labels, consisting of different shapes and colours are attached to each bottle, etc. These items are shipped by courier and are unable to be purchased online. We will provide a shipping quotation for these goods. In the case of orders that are packed & ready for shipment that are then cancelled by the customer then a restocking fee of $20 will apply.